Harsh New England winters are just around the corner. Who knows what this winter will bring. It seems every year we get at least some kind of hazardous weather – heavy snow, freezing rain, sleet, an occasional ice storm along with those bitter cold temperatures. No matter what the condition, at Mike Lynch Enterprises, we can help minimize that risk with professional sanding and salting. 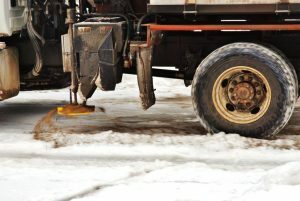 Keeping your commercial property free of ice and snow can save you time and money, which is good for your bottom line. Keeping your business ice-free is also good for minimizing the possibility of accidents. With a 24/7 radio dispatch service and fully-stocked sanding and salting equipment ready to go, we’re here to provide our customers with immediate assistance should bad weather roll in (and it will!). Clearing commercial properties such as driveways and parking lots to the bare pavement usually requires de-icing in some form. Here at Mike Lynch Enterprises, we are ready to assist. For almost three decades, we’ve been helping central Massachusetts businesses stay up and running despite the worst weather old man winter can throw at us. If you prefer to be pro-active, you can call us for a pre-treat application to ensure that your commercial properties are plowed and ice-free, ready for your customers. Get prepared now for this winter — contact Mike Lynch Enterprises and find out how our fully-insured sanding and salting professionals can give you a competitive edge this winter by helping you stay open for business.